No more tears on toast! ButterUp quickly turns cold, hard butter into easy to spread ribbons of dairy goodness. ButterUp quickly turns cold, hard butter into sumptuous easy to spread ribbons of dairy goodness. Our unique design features a built in grater to aerate and soften butter making it easy to spread. Easy to spread also means you use less too. The grater shape has been specifically designed for butter and to avoid sharp edges so cleanup is safe and easy. 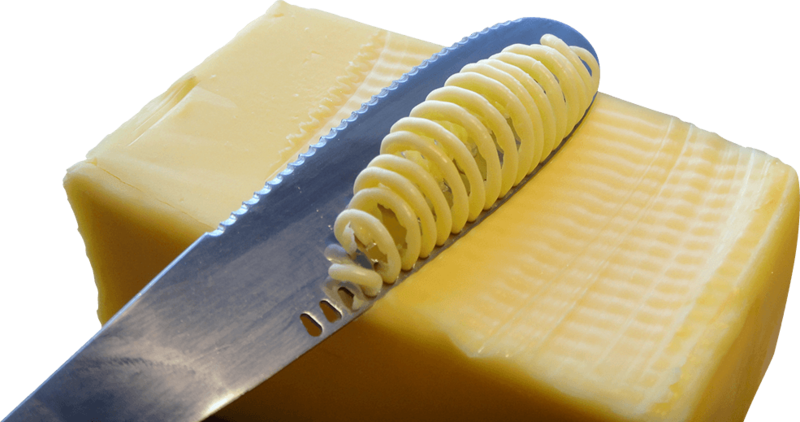 A wider blade helps to collect the grated butter as well as provide more surface area for easy spreading. ButterUp! is made from stainless steel that is dishwasher safe and long lasting. Choose from a classic polished finish or a modern satin finish. We would like to say a big thank you to all those amazing spreaders who pledged to our cause via KickStarter. You are amazing! Click here to see everyone who has helped us get to this point!